If you want longevity in your marital relationship, just delete your partner from your Facebook friends’ list. 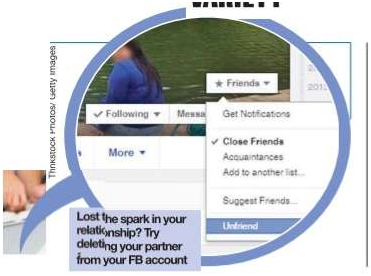 According to a New Yorkbased relationship expert, unfriending your partner on social media can put the spark back into your relationship, a website reported. Even better, the expert said, people should delete their Facebook accounts entirely to have more time to spend with their partners. Kerner said that the use of mobile phones means couples are spending less time talking to each other face-to-face, causing miscommunication and arguments. According to the Pew Research Center, 25% of married or partnered adults have texted their partner when they were both at home together. The same number have felt that their better half was distracted by their mobile phone and eight per cent have had arguments about how much time their partner spends online. Kerner, who has now deleted his Facebook account, said there were some challenges that arose in his own relationship because of social media. “I realised for a little while with my own wife that I did not really want her to be my friend on Facebook” he was quoted as saying.